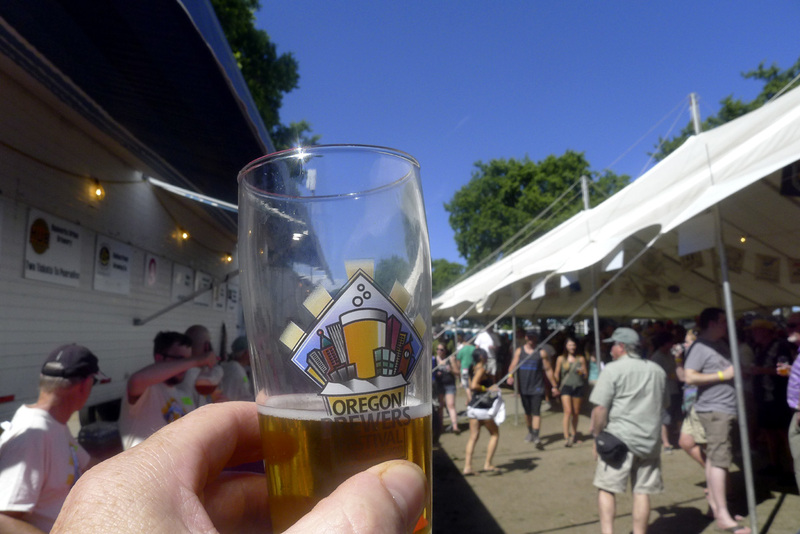 Because the Oregon Brewers Festival is the largest single event on the annual beer calendar here, it tends to attract a lot of attention and coverage. It might even be safe to say we over-cover the event. With that in mind, let me offer some final thoughts on OBF 26. For the first time in several years, attendance figures have been adjusted upward...to 85,000. This is based on the number of wristbands handed out. Because so many of us visit the festival on more than one day, the total is a bit nebulous. It would probably be more accurate to say 85,000 visits, but it's a good number either way. I will be interested to see the economic impact numbers, which will appear in a month or so. Jeff Dense, a political science professor at Eastern Oregon University, collects the data and puts that report together. I spoke to him during the festival, while he was busy collecting surveys in return for tokens. It sounds like the means of collecting data was tweaked somewhat from 2012, which is good. I did not embrace last year's finding that 70 percent of festival attendees came from outside Portland metro. The move to an actual glass was such a positive change that many were left wondering why it hadn't occurred earlier. You could see the beer, taste the beer, smell the beer. In defense of the OBF, this change likely would have happened earlier had they realized glass in the park was okay. They mistakenly believed the city had a rule against glass there. Not so. Beyond the obvious benefits of the glass, a residual benefit is the fact that people took these things home. I had family visiting from the Seattle area and they scooped up their glasses. We've got two of them on the glass shelf here. My wife informed me she wouldn't mind having a few more. So much for recycling. These glasses are keepers. Of course, I was one of several people who thought the move to a 3 oz taste was a bad idea. I didn't and don't have an issue with the economic reasons for the change. I merely thought the smaller taster would lead to more people getting full beers due to longer lines. And more drunks. In general, I didn't see that happening. I was there all afternoon Friday into the evening. I really didn't see that many full beers. In fact, the new glass did a nice job of obscuring the smaller taste size. That was either great planning or dumb luck. Probably the biggest problem the festival has faced in recent years is lines. Last year, there were dreadful lines Thursday afternoon. Friday afternoon and evening was a joke. Saturday was a mess almost from the start. I thought it might be worse this year. I was wrong. Some will surely point to the additional day as a partial reason. It surely helped. Wednesday was a mellow day, nothing like Thursday last year. There were plenty of people in the park, yet it was never hard to get a beer. Even Friday afternoon wasn't bad. There were lines for some beers, but you could work your way to the front in short order. Even if Saturday was bad, the line problem was largely minimized this year. Opening up the area between the tents and the beer on the south side paid off nicely. The open space helped keep people who had just filled up out of the lines, allowing those needing a fill-up to get beer quicker. There may have also been improved tactics built into pouring and serving...I don't know. Big win for the festival. As I've said in the past, it's going to be interesting to see what happens to the Oregon Brewers Festival over the course of the next few years. This has been Art Larrance's domain since the beginning. I had a chance to chat with him for 10 minutes or so Friday afternoon. He was relaxed and seemed comfortable with the fact that the event was humming along smoothly around us. I've sometimes seen him racing around like a maniac around that time. I can't help thinking Larrance, who will turn 70 on his next birthday, is gradually delegating many of the organizational and logistical responsibilities to the folks who have helped make the OBF a huge success over the years. Maybe I'm wrong. Regardless, the future of this event appears to be in good hands and looks bright as far as the eye can see. What's Up with OBF Pour Sizes, Anyway?